Sung-hee Choi of the Save Jeju campaign in South Korea reflects on the new developments on the Korean Peninsula, specifically the meetings between South and North Korea, as well as North Korea and the United States. While Sung-hee sees signs of hope for peace in the region, she points to the continued struggle ahead to confront increasing militarization in the region. This includes the need for continued nonviolent resistance towards the naval and air-force base projects on the island of Jeju, off the coast of South Korea. 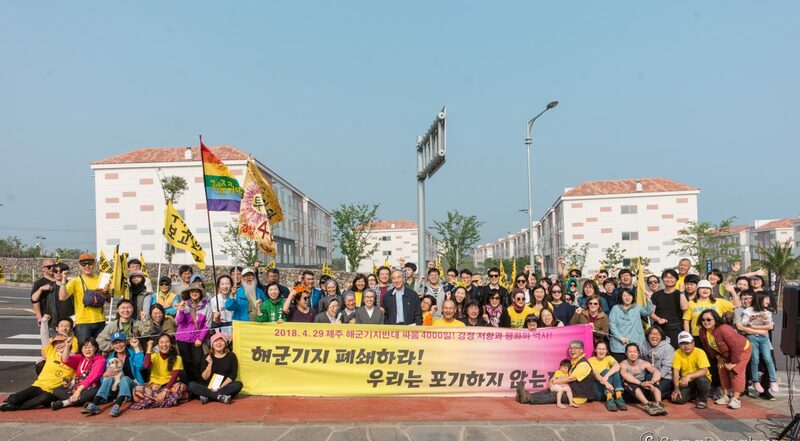 Activists on Jeju have now passed their 4000th consecutive day of nonviolent protest against the projects. On June 12th, 2018, at the historic summit between the United States and the Democratic People’s Republic of Korea (North Korea) held in Singapore, the governments of the U.S. and North Korea declared their commitments to security guarantees for the North Korea and the complete denuclearization of the Korean Peninsula. The U.S. government also declared their commitment to end of upcoming “wargames” in the waters of the region. This affirmed the previous commitments made on April 27th 2018 between the Republic of Korea (South Korea) and North Korea in the Inter-Korean Panmunjom Declaration. All of this was welcomed news for many Korean peace groups, and seen as concrete steps towards settling cold war era confrontations in the peninsula. We see this as a step towards peace, non-nuclearization, and the normalization of relationships in the region. Although there is still much skepticism, the outcomes of meetings between South and North Korea, and between North Korea and the U.S., should be greatly welcomed, encouraged, and implemented as a rare chance to realize peace in Korea and northeast Asia. We can begin to see prospects for the end of the Korean War. We can begin to see the possibility of the reunification of the nearly for the 10 million Koreans that are still separated family members as a result of the Korean War. Yet, there are major tasks that are still ahead: especially related to the ever-increasing militarization of the region. Despite the meetings in the last months, there is still a huge build-up of a U.S.-South Korean-Japan military alliance that is largely centered on U.S.-led missile defense system. This system has been built up largely under the ‘pretext’ of North Korean nuclear and missile threats, yet it is clear that the ultimate targets for United States are China and Russia, not North Korea. First, we have now passed our 4000th consecutive day of protesting against the Jeju navy base project enforced in Gangjeong village, Jeju Island, which is located off the coast of South Korea. There have been around 700 times of indictment against nonviolent villagers and activists. Among them, 60 people experienced incarceration. At least 22 internationals experienced deportations for their solidarity to Gangjeong. The navy base, whose construction was started in 2007 and completed in 2016, has now hosted over 10 foreign warships, including U.S. aegis destroyers and a U.S. nuclear submarine. The militarization of the island has not stopped. There is now a project underway for a 2nd Jeju airport that will be used as an air force base for the region while there are plans for an International Naval Review (naval show that displays warships) that may be held at the base in October 2018 despite villagers’ clear opposition to it. Second, there is a new military base being built in the mainland of Korea, the Terminal High Altitude Area Defense (THAAD), which began construction just days before the North Korea-South Korea summit (April 27th). THAAD, which was built to confront North Korea, should be withdrawn upon a new era of peace. If we want to see true peace in Korea and northeast Asia, we need to see the military bases that form the missile defense (offense) belt withdrawn and closed. These bases are righteously suspected to serve U.S. strategic interest in wider region beyond Korea, and would be an ongoing part of any military tension in the region. The navy’s scheme to host an international naval review/show with a U.S. nuclear aircraft carrier and many warships from 69 nations including 17 NATO nations in the Jeju base this October should be repulsed. The 2nd Jeju airport (air force base) project should be stopped. If we want real peace, all war exercises should be permanently stopped and we need to end the militarization of the region. While there are openings for peace, there are still major tasks ahead. Sung-hee Choi is an artist/art teacher, peace activist and key organizer within the Jeju naval base resistance. She works tirelessly in support of the cause of peace in and the division of Korea. Sung-hee is a member of the board of directors at the Global Network Against Weapons and Nuclear Power in Space. Her art and writing has inspired many to take up the Save Jeju cause. In the summer of 2011 she was imprisoned for her role in the Save Jeju effort. She can be reached at armha5156@gmail.com.